Join the University of Minnesota Crookston community for a celebration of Northern Minnesota grown and raised foods. Enjoy an evening dinner prepared by local chefs, featuring foods grown by UMC students, alumni and friends. 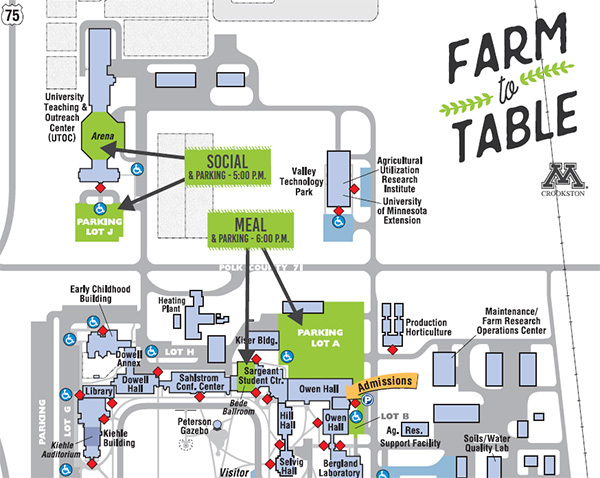 UMC senior, Caleb Rempel and UMC Horticulture Lecturer, Rick Abrahamson, have been growing a multitude of vegetables and sunflowers for this Farm to Table event. Savor vintage and select wines produced by Fantesca Estate & Winery and local poultry grown in central Minnesota by Protein Alliance. Fantesca Estate & Winery, a California wine company owned by University of Minnesota alumni Duane and Susan Hoff. Duane is the son of longtime Crookston residents and UMC faculty Dave and Irene Hoff. Protein Alliance is a global meat brokerage and trading company located in central Minnesota owned by Jeff Stauffenecker & Carl Wittenburg, both U of M Crookston alumni. Since seating is limited for this unique event, registration is required by October 25, 2018. We are unable to accommodate registration and payments at the door. If you can't attend, consider contributing to the Student Success College Fund at the University of Minnesota Crookston, please visit give.umn.edu/giveto/umcstudent. Susan and Duane Hoff were college sweethearts. While attending the University of Minnesota-Twin Cities, Susan worked at a stereo shop called Sound of Music. By the time the couple married several years later, the company had grown to 12 stores — and by the time their first child was born, 50. No longer called Sound of Music, the store was now known as Best Buy. Both Susan and Duane continued to establish successful careers in Minneapolis, helping grow Best Buy into the Fortune 100 company it is today. Eventually they were both ready to trade fast-paced corporate lifestyles for a new way of life — one where they could start a business as a family. In 2004, Susan and Duane purchased a 53-acre parcel with a 10-acre vineyard and named it Fantesca Estate & Winery. Fantesca’s winemaker Heidi Barrett is one of the few winemakers in the world to be awarded five perfect 100 point scores for her wines. Critics have dubbed her “the Queen of Cult Cabernet”. Duane is the son of longtime Crookston residents and UMC faculty Dave and Irene Hoff. Protein Alliance, Inc. is a fully integrated, global meat brokerage and trading company located in central Minnesota providing a diverse product line of proteins from all the major processors in the United States. Services include turkey genetics, farm production, processing plant management and domestic and international sales. Protein Alliance, Inc. was created in 1999 when Jeff Stauffenecker & Carl Wittenburg took their extensive experience in the agricultural industry and pursued their dreams on becoming entrepreneurs. U of M Crookston alumni, both have enjoyed building relationships with their customers, suppliers and are currently serving as board members, Jeff on the Minnesota Turkey Growers Association & Carl on the National Turkey Federation. Pan Seared Walleye with Pickled Cucumber, Beauty Heart Radish, & Red Onion, topped with Grilled Sweet Corn, Smoked Heirloom Tomato, & Roasted Red Pepper Relish. Accompanied by Fried Corn Tortillas and finished with Dill Aioli, Micro Dill & Corn Shoots. Mixed Greens tossed with Roasted Chioggia Beets & Butternut Squash topped with Shaved Apple, Rainbow Carrot, & Fennel Slaw, Olive Oil & Salt Toasted Pepitas, Cracked Pepper Chevre, and Bull's Blood. Served over Grilled Sourdough Baguette. Finished with White Balsamic Vinaigrette. Rich Stew of Tender, Burgundy-Braised Beef, Carrot, Cipollini Onion, Garlic, Cremini Mushroom, & Fingerling Potatoes with Sauteed Green Beans. Finished with Fresh Rosemary. Buttermilk-Brined, Roast Turkey Breast with Pan Gravy and Peppered Cracklings over Roasted Garlic Braised Kale & Onions, and Boursin Whipped Potatoes. Finished with Micro Kale and Citrus & Wine Macerated Cranberries. Blackberry and Rhubarb Tart with Crisp Crumb, Pecan Crust, and Vanilla Bean Whipped Cream. Garnished with Smoked Pecans, Wine Macerated Blackberries, and Maple Syrup. 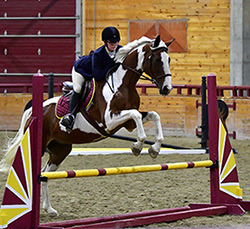 Enjoy local spirits and craft beer samplings from Revelation Ale Works and Far North Spirits, both of Hallock, Minnesota, while watching the UMC hunt seat equestrian team. The equitation showcase and social is sponsored by the Minnesota AgriWomen and Ag Country Farm Credit Services.